45 RPMs: Training Involution #98 | Robert Mitchell Jr. 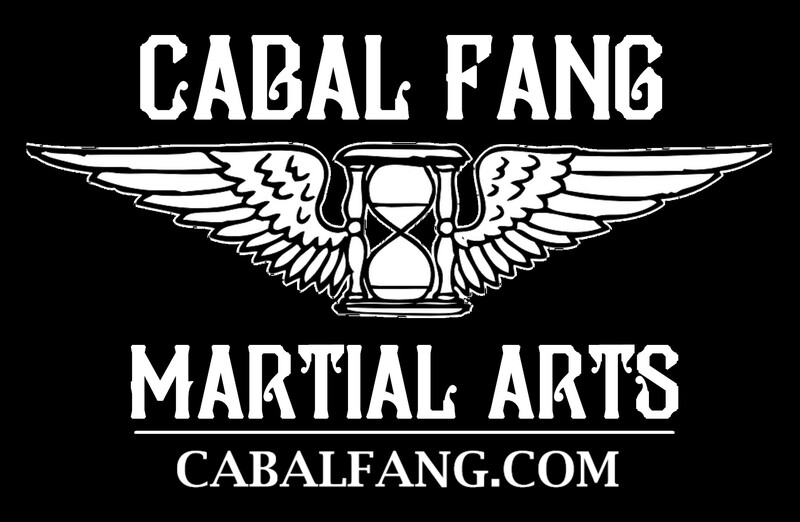 This is the Cabal Fang t-shirt design. You dig? This week’s training involution is inspired by one of Mark Hatmaker’s insane workouts (Thanks Mark, for pushing the envelope and inspiring the rest of us to try and keep up). Mark’s workout was way too much for this old man, so I modified it. That’s what I want you to do. If this is too hard for you, modify it. Don’t have the the equipment? Make your own or swap for similar exercises. Have a bad back, a bum knee or some other chronic issue? Don’t quit, just swap exercises for something that allows you to work with the body you have. Don’t have the gas? Take as many 12-count breaks as you need to finish or modify exercises. Examples: If you burn out on Push-ups do the rest on knees, if you get fried on Pull-ups start doing Chin-ups or just leap to the bar and do negatives, etc. Don’t know where to begin? Does this workout seem too hard to even start? Send me an email at first.elder@cabalfang.com and we’ll talk. Why is modification and adaptation so important? That’s how people overcome adversity! A few years ago my lower back was so bad that I could barely get out of bed some mornings. But I started a progressive weightlifting program. I still have bad days and I’m far from super strong, but I’m able to do Back Bridges with a hundred pound heavy bag on my chest, and that’s nothing to sneeze at. Don’t compete with others. Do the best you can with with your equipment — your body, your gym, your life and your budget. By the way, there are some major announcements in the quarterly Cabal Fang State of the Art Dispatch. Did you get it? No? Well that’s because you’re not subscribed! Click here to fix that problem. “RPM” stands for “Reps per Movement.” Do you remember 45 RPM records? Then you get the pun. As long as you get your 45 reps, doesn’t matter how many sets. I did both the weightlifting and the calisthenics segments in half-pyramid format. In other words, 1 Hang Clean & Press, 1 Squat, 1 Chin-up, then 2 of each, then three, then four, etc. up to 9 of each. 45 reps of each weightlifting exercise: Dumbbell Hang Clean & Press, Back Squats, Chin-ups (weighted if desired). If you don’t have the required equipment, use a sandbag (throw sand, chains or gravel in an old duffle or backpack) and do Sandbag Hang Clean and Press, Sandbag Squats, and Sandbag Curls. Warm up fully before you begin! 45 reps of each calisthenic: Squats, Diamond Push-ups, Jackknifes, Get-ups, Side Lunges, Wall Touches. 45 Drop Duck-Unders. If you don’t have a partner do them solo (if you have a hanging heavy bag, square off against that). Video here. 45 Striking Combos for power. Go after your heavy bag with maximum malice, delivering 45 striking combos — punches, kicks, elbows, knees, you-name-it (3 strikes per combo minimum). 45 minutes of contemplation. I’m an advocate of 10 mins of contemplation per day, but the occasional long session of 20 minutes or more can really open doors. Set a timer, assume your posture of choice, regulate your breathing and allow your thoughts to dissipate like ripples in a pond. Don’t feel badly if you can’t make the whole 45, just do the best you can. If your legs cramp up and you have to stop after 30 minutes, pick up the other 15 minutes later that day. † My weights for the above exercises were #30 per dumbbell for the Hang Clean & Press,#95 on the Squats. I did the Chin-ups without weight and the last dozen or so I had jump to the bar and do negatives.